Established in 1993, Hat Rubbers is a leading Manufacturer and Exporter of all kinds of Moulded and Extruded Industrial Rubber components. We cater to various industries like Space, Railways, Textiles, Tyre, Steel, Engineering, Bottle Plants, Automobiles, Cement, Refineries, Chemical, Tanneries, Sugar foundaries and many other Government undertakings. We also specialize in manufacturing components both moulded and extruded in rubber like Viton, Silicon, EPDM, Butyle, Neoprene, Nitrile and Natural Rubber. We have developed technology for casting and injection moulding for all kinds of polyruthene components. We also manufacture customized products based on samples, drawing or specifications given by the customer. The objective of Hat Rubbers is to provide it’s customer with the Quality Rubber products and services at affordable prices. 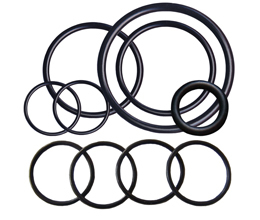 Our product range includes Oil Seals, U & V Seals, Chevron Packings, Diaphragms, Bushes, Washers, Rubber Sheets etc. We also keep stock of spare tyres for tyre couplings, Spiders for Lovejoy Couplings, Conveyor Belts, Trolley Wheels etc. 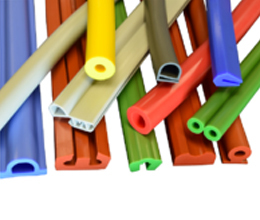 Our Extrusion capabilities are available in straight or in bonded shapes to form an endless components. We can Extrude a Custom profile of any size 2 feet to 50 feet in length of Buna – N, Viton Silicon or E.P.D.M.